Sacre's Class 6C (LNER J12) design was his largest goods locomotive design for the Manchester Sheffield & Lincolnshire (MS&LR, later GCR). They were of a typical Sacre design with a round-topped firebox and double frames. The J12s were provided with cabs which were a significant improvement over earlier "bent-over" weatherboards. Sixty two J12s were built at Gorton in six batches between 1880 and 1885. The J12s were robust and tough looking locomotives which quickly acquired the nickname of "Bulldogs". Robinson rebuilt all but two of the J12s with his "Standard No. 1 Belpaire" boiler and a larger cab between 1909 and 1920. The general effect was to enhance their already tough appearance. Withdrawals had already started on the eve of Grouping (1923), and the LNER did not make any significant alterations to the J12s. Some chimney swaps are recorded, but these are hard to explain because the J12s were already within the LNER's Composite Loading Gauge. The J12s were as rugged as they looked, and they were popular with enginemen. Both the Mexborough and Sheffield sheds used them extensively for coal and freight traffic. The Cheshire Lines also made good use of them with allocations to Liverpool, Northwich, and Cornbrook. By Grouping (1923), the entire class was divided between Mexborough (41), and Trafford Park (21). Some of the Mexborough allocation operated out of the Lower Ince sub depot and hauled occasional passenger excursions. The first J12 to be withdrawn was the un-rebuilt No. 33B in August 1922. The LNER continued the withdrawal programme which speeded up as large numbers of O4 2-8-0s were introduced displacing the younger J9, J10, and J11s onto existing J12 duties. 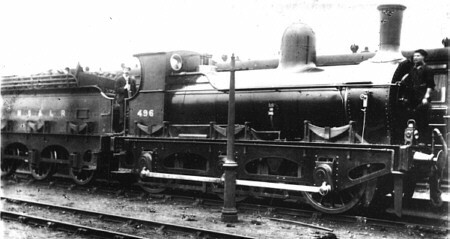 The last J12 was withdrawn from Trafford Park shed in February 1930. None of the J12s survived into preservation. Bill Bedford produces a set of brass etchings to build the Belpaire version of the J12 in 4mm scale. This is described as being an advanced kit that currently excludes castings. Thank you to Malcolm Peirson for the photograph of MS&LR No. 496.